John sees an abominable woman, "the Mother of Harlots" sitting on a scarlet beast. She signifies "the great city that rules over the kings of the earth" (Revelation 17:18). The woman’s name in the vision is Babylon (Revelation 17:5) although her real name in Christian times is Rome. Rome and Babylon were both the capital cities of world-empires that became corrupt. judgment The visions John is seeing in Revelation 12 to 20 are about judgment day. This vision in chapter 17 is the judgment of "the great harlot" (Revelation 17:1). sits on many waters This atrocious woman "sits on many waters" (Revelation 17:1) This makes her a sign of the same kingdom represented by the beast from the sea, whom we met in chapter 13. The sea is described as "many waters" (Revelation 17:1) to indicate a dominion over many nations spreading accross the world from sea to sea. kings of the earth John sees the kings of the earth committing acts of immorality with this harlot (Revelation 17:2). This again symbolizes that many nations are under the thrall and dominion of the wicked empire that she signifies. into a wilderness John is now carried in the Spirit to a new scene. He is in a wilderness, signifying the spiritual realm of Satan. scarlet beast And so now John is able to see the scarlet beast upon which the great harlot is riding. This beast is Satan the dragon. Notice that the scarlet beast has the same signs as the dragon. They both are red and have "seven heads and ten horns" (Revelation 17:3, Revelation 12:3). In a moment, we will have more to identify the scarlet beast as Satan the Dragon. The atrocious woman rides on the very beast from which the glorious woman had to flee with wings of an eagle (Revelation 12:13-16). adorned with gold and pearls (Revelation 17:4). The antichristian world empire, which this harlot represents, is rich. It has financial dominion to support its political and military power. gold cup full of abominations (Revelation 17:4). The harlot holds a gold cup filled with unclean things. Again, the gold cup represents wealth, but what is in the cup represents the corruption and injustice that often accompanies great wealth. name on her forehead... a mystery (Revelation 17:5). In the visions of Revelation, it is common for those whom John sees to have a name on their foreheads, either the name of the Beast or the name of Christ. The name on the harlot’s forehead is a “mystery”. This doesn't mean you can't understand it. Rather, it means that the name Babylon is a sign or symbol signifying the antichristian kingdom and its capital city. mother of harlots The harlot’s full name is "BABYLON THE GREAT, THE MOTHER OF HARLOTS AND OF THE ABOMINATIONS OF THE EARTH". 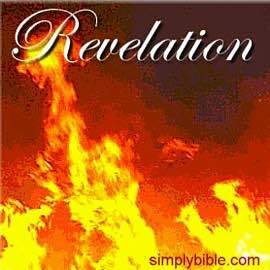 (Revelation 17:5). Part of her name is “Mother of Harlots”. This is a warning to us that even after the antichristian kingdom falls, it will leave children behind just as evil as itself. Antichrist will live on in the world until judgment day. drunk with the blood of the saints (Revelation 17:6). John sees that the harlot has got drunk with the abominable wine in her gold cup. One of those abominations is the killing of those who wear the name of Christ, and making them martyrs to his cause. “I will tell you the mystery” (Revelation 17:7). For the rest of chapter 17, the angel is going to explain the visions that John is seeing. This provides a valuable section to help us understand the judgment visions more clearly. We will devote our next lesson to the angel’s explanation. —About a very splendid and heavenly woman of great power in chapter 12, and an atrocious and disgusting harlot who rides on the Dragon in chapter 17. Tap the title above, next to the arrow, to go to that lesson with a link back to this page. —Some of the personal passages from Paul’s writings make us wonder how he ever coped. If he had patience in his circumstances, then he is well qualified to be a mentor for us. Tap the title above, next to the arrow, to go to that lesson with a link back to this page.